With the advance of mobile technology, mobile devices have become more portable and powerful with numerous useful tools in daily life. Thus, mobile learning has been widely involved in e-learning studies. Many studies point out that it is important to integrate both pedagogical and technical strengths of mobile technology into learning settings. Thus, the purpose of this study aims to investigate the effects of implementing a ubiquitous multimedia message transmitting platform (U-Msg) for college students' English learning. 19 college students participated in a four-week experiment and each student used client-side application platform U-Msg platform for English learning through an Android-based mobile phone. After the experiment, a survey questionnaire with 22 questions was administered. The findings of this study show that those participants hold significantly positive attitude of U-Msg platform, including platform quality, learning content, platform support, platform usefulness, user satisfaction, and platform use. That is, this U-Msg platform for English learning can be effective and suitable for college students' English learning. Shih, R.C., Cheng, Y.M., Kuo, S.H. & Lou, S.J. (2016). The Development and Implementation of U-Msg for College Students' English Learning. 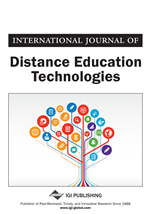 International Journal of Distance Education Technologies, 14 (2), 17-29. IGI Global. Retrieved April 21, 2019 from https://www.learntechlib.org/p/186291/.